Scottish Chambers of Commerce (SCC) hosted its 23rd Annual Business Address last night (Wednesday 2 December) at the Hilton, Glasgow. SCC Chair, Nora Senior, will address 500 senior business leaders from across Scotland and beyond, urging action by both business and government to raise the game in order to deliver a more dynamic and prosperous Scotland. 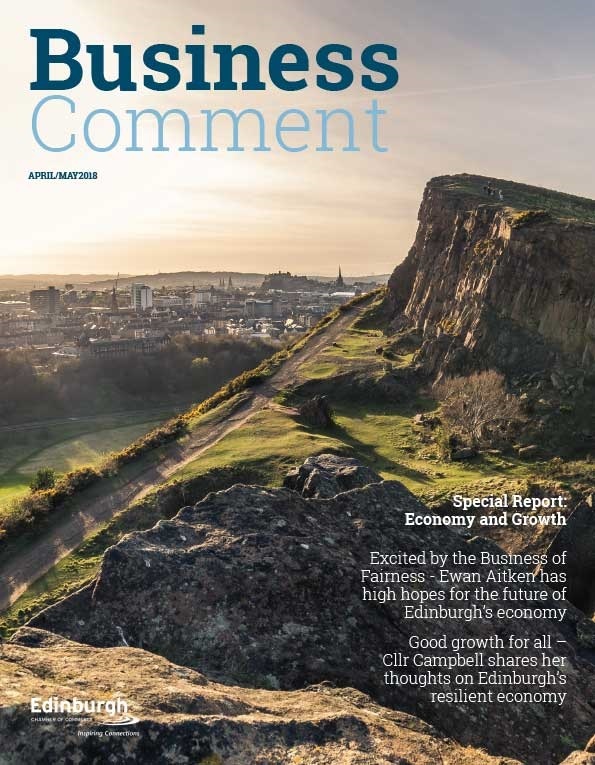 “As Scotland enters a new era of devolution, the challenge for business and government alike is to raise our game. Action needs to be urgently taken on supporting four key areas – international trade; ecommerce; bridging the gap between business and education; and supporting women into work. “With just 100 Scottish companies responsible for over 60% of Scotland’s exports, I passionately believe that we need to work harder to get more Scottish businesses exporting. Over the past three years, Chambers has extended its range of B2B trade support services, particularly focussed on SMEs, expanded our Global Business Network and established private sector partnerships Our aim is to build an additional complementary programme of engagement for international trade and encourage a redesign of how Scotland approaches and delivers international trade. “E-commerce plays a major role in international trade and is a channel that is tailor-made for Scotland. 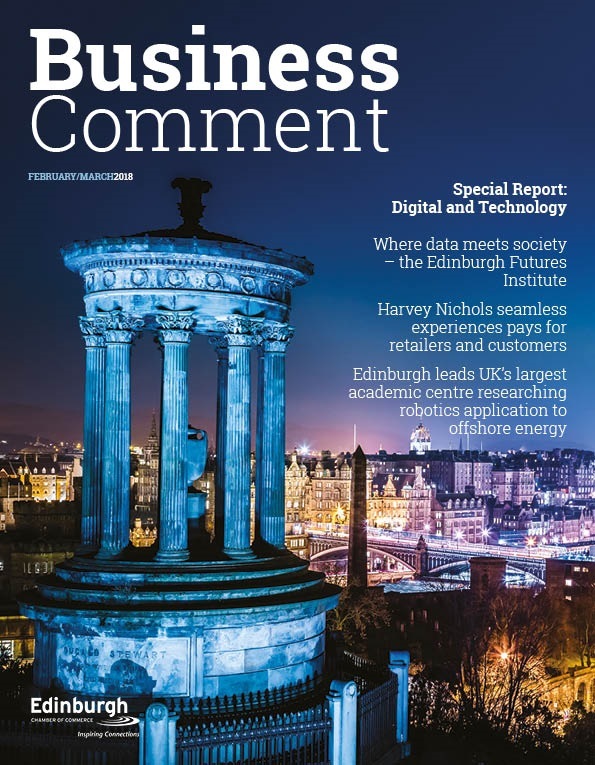 As successful practitioners like Fan Duel and Skyscanner have shown, e-commerce obliterates distance from markets and allows Scottish companies, even those in remote rural locations, to compete on a level playing field for business. 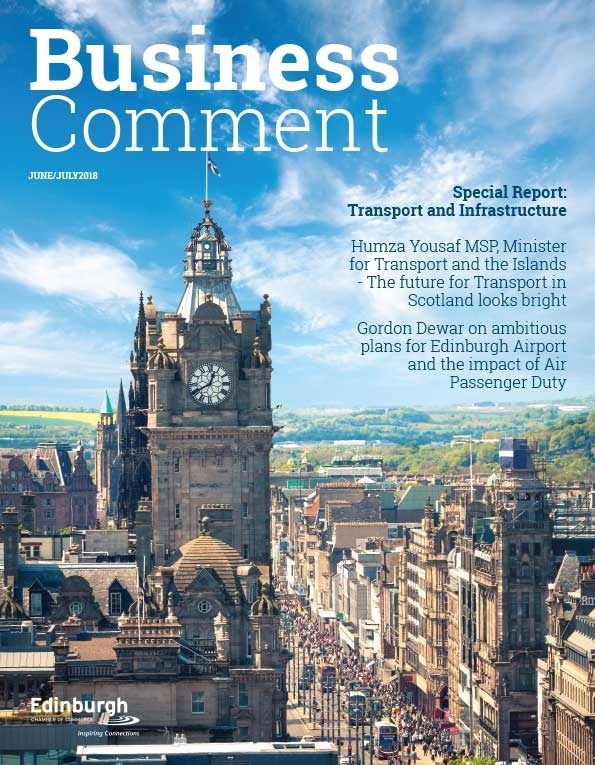 “Digital communications infrastructure is as fundamental to 21st century Scottish industry as canals were to the 18th, railways to the 19th and motorways and airports to the 20th century. Government should plan its investment accordingly. – not just investment in physical networks of fibre optics, broadband and 4G, but also the human factor – ensuring that no-one is excluded from the digital marketplace, and that superior ICT skills are instilled in our children. “Although gender discrimination has no place in the workplace in 21st century Scotland, employment needs to fill a skills gap, not just a gender gap. While imposing quotas might look like a solution on paper, it is unlikely to make businesses better. Instead we need to focus on key areas like childcare that enable parents to remain in the workplace. We need an explosion in childcare provision – the chasm between parental leave and the start of ‘free’ childcare is swallowing up too many talented people and damaging our productivity and competitiveness. Business needs to do its part by stepping up to the task of nurturing the pipeline of women at middle management level onto executive boards. “In terms of bridging the gap between business and education, preparing students to face potential employers has to be given the same level of priority as academic achievement in schools. Our schools and colleges need to be properly prepared to participate fully in the economy of the present and the future, preparing young people for the fulfilling, high-skilled jobs that the 21st century economy demands. Chambers are working hard to break down the stubborn divisions between our educators and our businesses and are helping young people with their career choices and aspirations, particularly through the initiative of Regional Panels. “The next Scottish Parliament will be a very different animal to the one we have got used to over the past 16 years. The Scottish political dynamic must move away from endless debates about how taxpayers’ money is spent, and instead develop an increasing focus on how those taxes are raised. Politicians will be judged on their actions, not their words, and there is an opportunity here for devolved powers to be exercised in the service of wealth-creating employers rather than talking about them in the abstract.